Our daughters are 3 and 5 years old now. Since they were only some weeks old we travelled together through Europe, to Mauritius, South Africa, Thailand or New Zealand. It was an enjoyable time and we learned a lot about different cultures, our own limitations and the new horizon travelling creates. Some families homeschool their kids, others nonschool them. We took these options into consideration, but decided to spend the following years in one city in Europe. For sure, we’ll travel as often as possible, but only during school holidays. I read a study about the feeling of “home”. It made clear that it’s impossible to create that feeling above the age of 7. It’s important for me, that my child has long lasting friendships and not only with children she got to know for some weeks. I want her to be able to have that cosy feeling that provides a safe and constant surrounding. The clock is ticking. In only 10 months she’ll start school. For travel addicts this means: let’s travel as long as possible and combine many beautiful destinations. Let me tell you about our family round the world trip starting in only 3 weeks. End of November 2014 we fly to Ecuador. The initial point was a friend of us who became teacher at the international school in Quito. She moved there with her two daughters for a 2 year period. It was clear for us that we’d love to visit her and use her insider information for us. Having a friend on spot is a huge advantage. Ecuador has 15 million inhabitants and is one of the most diverse countries of the world – geographically, topographically and ethnologically. The climate varies a lot, therefore we need to pack bikinis as well as raincoats. Ecuador is a bit larger than Great Britain and crossed by the equator – true to its name. Some volcanoes are still active and erupt frequently. Unfortunately flying to Ecuador from Europe means many hours in the plane and changing aircrafts 2 times. Be tuned about my first post how we landed in Quito. I’m curious as well if the beginning of our family round the world trip was a blast. South America is a clean sheet for me. I’ve read many posts and articles, but have never been there. Besides, my last spanish lesson was 8 years ago. I guess that’ll pose a challenge. After 5 days in the highest capital of the world (2850m high = Quito) we’ll head to the Galapagos islands. Flights were incredibly expensive some years ago. The Galapagos islands belonged to the UNESCO World Heritage Site. Giant turtles, sea lions, many different birds and lizards inhabit the 13 islands. So access was strictly controlled. In 2010 the World Heritage Committee decided to strike them from the red list. 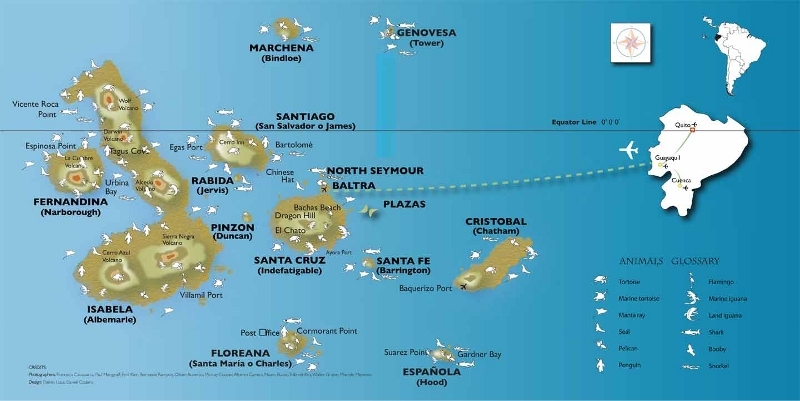 To limit access there’s a fee of 100$ to enter the Galapagos National Park and a 10$ fee at the airport. Luckily our flights departing in Quito are only 220€ per person. The accommodation prices there vary a lot. It’s very complicated to find something below 40€ per night for 2 persons. We are 4 and will have to spend at least 80€ per night. I searched on Airbnb and booking.com. But the journey itself will show if we have found good ones. Many travel guides recommend to spend one week on the Galapagos islands. As we’ll stay one month in Ecuador before our family round the world trip goes on we do it a bit more relaxed and enjoy the unique nature 11 days long. Possible activities there are diving with hammerheads, boat trips, snorkeling and hiking. We will do a bit education with the kids and explain them the animals and the nature. But as always we’re interested in the way of living. People who live on islands are always a bit special as their space is limited and they live often in a huge community of friends and family. On the Seychelles we saw the overall accepted polyamory. Men have different partners at the same time, children from different women, socially fully accepted. Maybe the Galapagos islands show us a different way of living. The first three nights will be spent on the island San Cristobal, the fifth biggest island. Then we will take the ferry or a speed boat to Santa Cruz, the second largest island. Unfortunately there are no possibilities to book in advance. All advices are to go one day before to the harbour, buy the tickets and enjoy the bumpy ride. Tickets are around 40$ per person for a 3h trip. On Santa Cruz is the second airport: Baltra which we use to fly back to Quito. Hopefully the water taxis are cheap and well organised as we’d love to visit some more of the 13 islands. After these 11 days Banos and some other towns come next. But the exact planning will be done on spot. We are the on spot planners and enjoy the flexibility and possibility to drift. How do you plan your trips? Have you ever been on a family round the world trip?